The SX-4462 Hall Effect Magnetic Non-Contact Torque Sensor from TT Electronics enables secure, tactile steering control that is unaffected by vibration, contamination or wear factors. The unit is suitable for ORVs, ATVs and UTVs in quarries, factories, farms or construction sites. It has a supply voltage range of 4.5 V-5.5 V and a maximum current of 20 mA. The sensor offers high linearity near the zero position and a torque angle of ±5° and performs multi-turn measurement over ±2.5 turns. 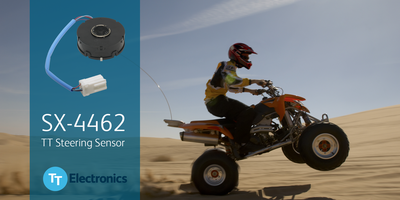 Woking, UK, 27 November, 2018 - TT Electronics, a global provider of engineered electronics for performance critical applications, has introduced the SX-4462 Hall effect magnetic non-contact torque sensor, a flexible and cost-effective sensor offering high accuracy and diagnostic capabilities for electronic power steering (EPS) applications including off-road vehicles (ORVs), three-wheelers, light commercial trucks, and tractors. TT Electronics is a global provider of engineered electronics for performance critical applications. With nearly 5,000 staff members operating from 28 key locations around the world, TT designs and manufactures a wide range of electronic components, power management, manufacturing and IoT connectivity solutions for applications in the aerospace and defence, medical, industrial and transportation sectors.